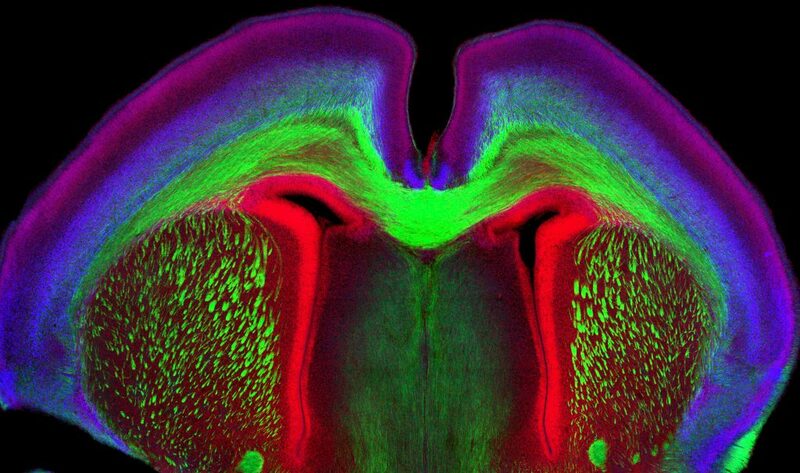 Coronal section of the mouse brain at embryonic day 18. L1CAM (green) marks axonal fiber tracts. TBR1 (Red) is a transcription factor expressed in potmitotic projection neurons. Hoechst stain (Blue) stains DNA and marks nuclei. Image courtesy of Stephanie Gupton’s lab. The Curriculum in Neuroscience is an interdepartmental, interdisciplinary training program leading to a PhD degree in Neuroscience. We represent 15 different departments and specialized research centers, but we are united in our interest in understanding the brain, neurons, glia, nervous systems, behavior, neurological disease, and neuropsychiatricdisorders. Faculty in this program develop and use cutting edge genetic, cellular, molecular, behavioral, and imaging technology to understand how brain forms and functions. Our program has outstanding courses, broad training in scientific communication skills, and diverse research areas to pursue during rotations and dissertation research. Currently we have 61 core faculty. Complete core and elective courses.. Attend weekly Neuroscience seminars (talks by leading neuroscientists from around the world, followed by lunch meeting with students). Present a poster each year at the Annual Pierre Morell Student Research Day. Pass a written qualifying examination covering the material in the core courses. Write and defend a dissertation proposal in NIH grant format. Publish one or more first-author papers.